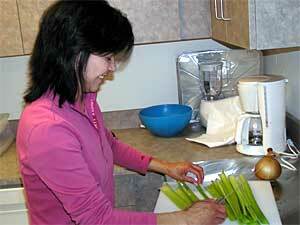 Many Red Lake band members live in the Twin Cities, nearly 300 miles from the Indian reservation. Many of them lost friends and family in Monday's shootings, or know someone who did. Minneapolis, Minn. — In a small community kitchen in a south Minneapolis Native American training and social service center, a man and two women prepare a hot dish they'll take to the nearby All Nations Indian Church. Community leaders have designated All Nations as the Twin Cities gathering place to mourn victims of the Red Lake Lake school shootings. "We're just going to throw together some food for the families and for the community here that will come together," says Alberta Loso, a member of the Mille Lacs Band of Ojibwe. She says she wants to do whatever she can to comfort the people of Red Lake. "I just think it's really important, just to know that they have other people that know what they're going through and care," she says. Randy Door is also a member of the Mille Lacs band. When asked what's going through his mind the day after the shootings, he tears up. "It's a sad day. A sad day for Native Americans," he says. Red Lake officials say about 2,500 of their band members live throughout the Twin Cities Metro area. Many of them have ties to the people who were wounded or killed. "My grandchildren go to school there," says Ona Kingbird, who teaches the Ojibwe language at the Heart of the Earth Indian charter school in Minneapolis. She says her 11th grade granddaughter knew the boy authorities say fired the shots. "She was going to the bathroom and she heard shots, and she looked in the hallway. She said she saw him going down the hallway shooting, and she ran out. A whole bunch of kids running off. They jumped in cars and took off from the school," Kingbird says. Kingbird says her granddaughter confirm reports that a motive for the shooting may well have been harassment. "It's the constant teasing, bullying throughout the years. She seen it," she says. Kingbird says her cousin's granddaughter is among the dead. Johnnie Smith, the chairman of the board of the Minneapolis K-12 grade Indian charter school, is also from Red Lake. He says most of his students are aware of the shootings. I am wishing that I could be home to offer my hugs and support for my family members that are at home. "Our director of education and me are going to sit down with some of them and talk to them, and try to do our best to get these kids through it," says Smith. "One kid ... is related to someone up there, and he came in here this morning and he wanted to go home. So I had one of our people run him home because he wasn't feeling good." Smith says he's concerned about the spotlight now shining on Red Lake. He says there's been too much misinformation in the immediate aftermath of the shootings. "The media always makes a big thing out of it. I imagine this will be on TV for two or three weeks to come. They don't know when to stop. Just leave it alone. Let the people do what they have to do to get over this." Community leaders say they expect Twin Cities Indians with friends and family on the Red Lake Reservation will be heading north, to help back at home. "I am wishing that I could be home to offer my hugs and support for my family members that are at home," says Arlene Downwind-White. Downwind-White, who manages the Red Lake Urban Office, where tribal members can get help securing social services, says she'll wait a while before returning to the reservation. She says she can help more people in her capacity in the Twin Cities right now. "I'm pretty positive that a lot of people will be going home. Because this number of people that have been affected is going to ripple throughout our whole reservation, and throughout the Minnesota area as well," she says. At the All Nation's Church in south Minneapolis, Diane Archambault says she's come to mourn and lend her support, but also to be comforted by others. "There's a lot of hurting people, grieving. I hurt. Them are my people," she says. Archambault says her niece was in the Red Lake school when the violence broke out. She says the shootings deeply traumatized her niece, and she and the other kids can't stop crying.